BRIDGEWATER, Mass. – After weathering a tough opening quarter, Attleboro took a lead into halftime and held onto it until the midway point of the fourth quarter. But the Bombardiers never landed the knockout punch, never fully took control of the momentum, leaving the door slightly open for Bridgewater-Raynham. The fifth-seeded Trojans pounced, using a 9-0 run over a two minute span that erased a deficit and turned it into a lead — one they wouldn’t relinquish in a 74-71 win over 13th-seeded Attleboro. “In the postseason, every possession matters, offensively and defensively,” said Attleboro head coach Mark Houle. “I thought we had some good momentum on offense but then we’d give up a transition basket. Our momentum was short lived because they came back and got something quick a lot of the time and I think that was a huge difference tonight. After trailing by as much as nine in the first half, the Bombardiers used a successful second quarter to take a two-point lead into half. That two-point lead grew to a five-point advantage heading into the final frame and stayed at the point until midway through the quarter. Jake Dunkley (17 points, eight rebounds) hit a pair of free throws to give Attleboro a 61-55 lead with just under six minutes to play but the Trojans were ready with a response. Bridgewater-Raynham senior — and former Taunton standout — EJ Dambreville drained a deep three on a kind bounce to cut the deficit to three. After getting a stop on the defensive end, B-R took advantage of an offensive rebound, eventually finding the hands of Griffin Perry. His trifecta tied the game at 61-61 with just our four minutes to play in the game. The Bombardiers were tripped up while going to the basket on the next play, one of the few times there wasn’t a whistle on the play. The teams combined for over 40 fouls and 61 free throw attempts. Bridgewater-Raynham took advantage of the no-call when Darrius Hyppolite drained his third three of the contest to give the Trojans a 64-61 advantage. 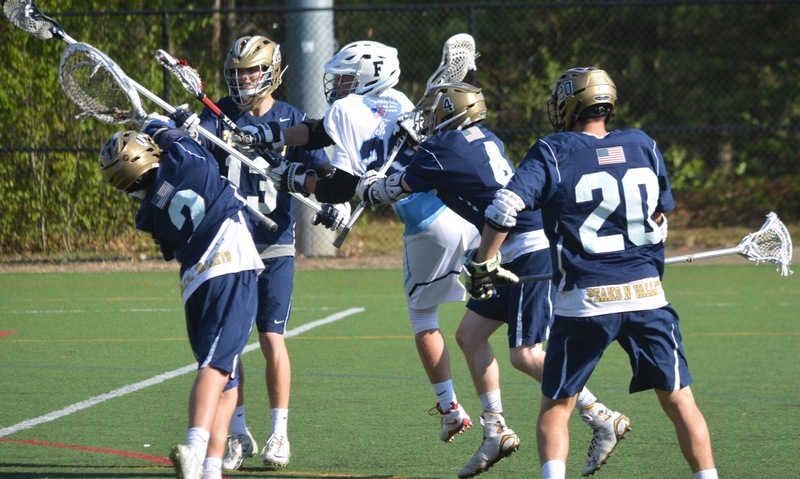 “We kept that six point lead in the second half and it seemed when they would get it to four, we kept pushing it back to six or eight,” Houle said. “There was a couple of possessions in a row they got some threes, Dambreville had one from deep, then they got one to tie it and then they hit one to go ahead. THat’s when they got the momentum, it really went in their favor. It ended up being somewhat of a difference when they got over that hump. Down the stretch, they executed their transition offense better than we executed our defense. 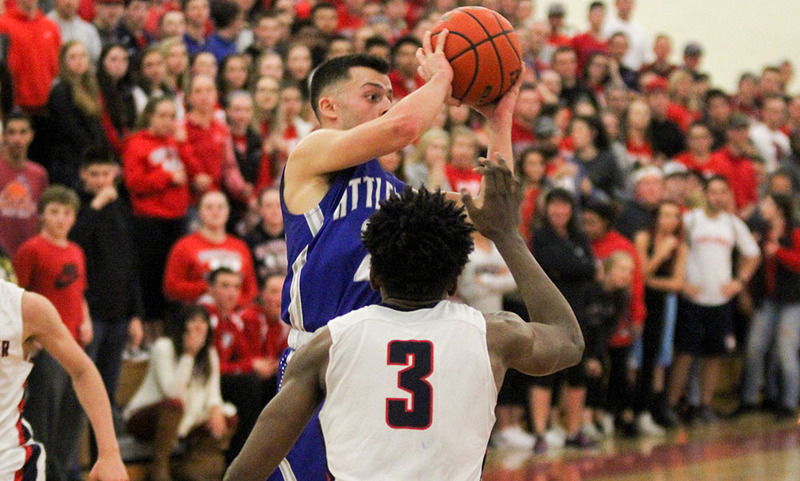 Attleboro snapped its near three minute scoreless streak with a pair of free throws from Dunkley to cut the deficit to two but B-R answered with a baseline jumper from John Tesson, who had a team-high 18 points. Bombardiers’ freshman Bryant Ciccio (14 points, four assists) answered with a pull up jumper from the foul line to get with two again. Attleboro for the miss it needed but Dambreville went up, got a slight tough of the ball and pulled the rim down, allowing the ball to fall in for two. The teams each traded a free throw as the B-R advantage stayed at four (70-66) with under two minutes to play. Attleboro had two looks to cut the deficit but missed the front end of a one and one and a missed on a drive to the basket. B-R then hit free throws down the stretch. Andrew Milliken (14 points) hit a late three to get to the final score. The Trojans built an early lead through high pressure, forcing Attleboro into turnovers or quick shots. B-R took an early 11-3 lead and went up 16-7 on a three from Perry. Attleboro got back into the game with an 8-2 run – a bucket from Dom Victor and three point plays from Milliken and Qualeem Charles (seven points, eight rebounds). But Perry hit a late three and then Dambreville got on to go just before the buzzer from just over half to put the Trojans up 24-15 after one. Ciccio took over in the second quarter for Big Blue, scoring 10 points in the quarter to help the Bombardiers go from behind to ahead. Over the first four and half minutes of the quarter, Attleboro went on a 13-4 run with Ciccio hitting a pair of free throws to tie the game. Ciccio’s lone field goal – which turned into a traditional three point play – of the quarter put Attleboro ahead by two. Lucas Boucicaut drove to the basket for two, giving Attleboro a 36-29 lead. B-R close the quarter on a 6-1 run to get within two at half. Attleboro boys basketball finishes the season 13-10 overall, tied four fourth in the Kelley-Rex. The Bombardiers will graduate four players, including Dunkley, who finished with over 900 career points. Houle had high praise for all four of the seniors. ATTLEBORO, Mass. – North Attleboro senior Kyle McCarthy took the inbounds pass with 5.7 seconds to go and streaked up the right side of the court. He switched the ball to his right hand before crossing back to his left as he hit the three point line. He found space between a pair of defenders, rose up and released. The ball seemed to take a deflection off a defenders hand, hit the front end of the rim, took a bounce and fell through the net as time expired. 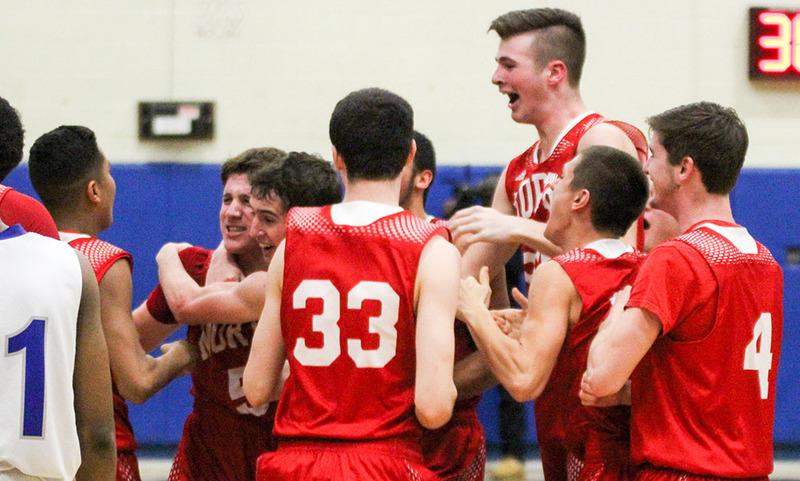 The result was a 56-54 win for North Attleboro in a non-league contest with rival Attleboro, giving the Rocketeers a season sweep of the Bombardiers. Both sides traded baskets throughout the fourth quarter, with Attleboro taking a 50-49 lead with just over three minutes to play on a jumper from Nate Douglas. But North had an answer right away as Hacmoni Cuevas took a pass from McCarthy and drained a three near the end of the shot clock to put North ahead 52-50. The teams traded misses before McCarthy came away with a steal and went down for a layup. His shot rimmed out but senior Jonny Friberg (22 points, 12 rebounds) was there to clean it up with the put back with 1:22 to play. Attleboro senior Jake Dunkley (20 points, 10 rebounds) cut the deficit in half with a pair of free throws with 1:01 to play. The Bombardiers came away with a stop on the defensive end and sprinted ahead to try to find the tying bucket, but North came away with a steal to take possession with 28 seconds to play. Attleboro was forced to foul its way into the bonus, sending the Rocketeers to the line for a one-and-one opportunity. North missed the front end, giving the Bombardiers a final chance with 12.9 to go. Douglas navigated his way around a screen and drew the foul to head to the line with two shots. North Attleboro coach Sean Mulkerrins called a timeout before the shots to draw up the play. The largest lead of the entire game was nine, coming midway through the first quarter when Attleboro raced out to a 15-6 lead. Back to back threes from Cuevas and McCarthy helped the Rocketeers cut the deficit down, trailing 17-12 after one quarter. North surged back to take the lead on back-to-back baskets from Doherty (17 points) and McCarthy but a quick 6-2 surge from the Bombardiers gave the hosts a slim 29-27 advantage at half. It was a see-saw third quarter with Andrew Milliken (eight points, seven rebounds) hitting a three to put Attleboro ahead only for Doherty and Friberg to hit back to back buckets to take the lead back. Dunkley converted a three point play, Friberg responded with two free throws to tie it and then Dunkley drained a three for another three point lead. Friberg added two but baskets from Dunkley and Lucas Boucicaut created a five point separation. Doherty cut into that with a three, Attleboro’s Elvin Sam (13 points) pushed it back to four with a layup, Friberg answered again but Dunkley had the final basket of the quarter to give the Bombardiers a 46-42 edge heading into the final quarter. North Attleboro boys basketball (14-7 overall, 10-6 Hockomock) will conclude the regular season on Wednesday when they host Bishop Feehan. The Rocketeers have a chance to earn a home playoff game with a win. Attleboro (12-9, 8-8) will finish the regular season with a trip to Durfee on Wednesday in a showdown of two D1 playoff teams.